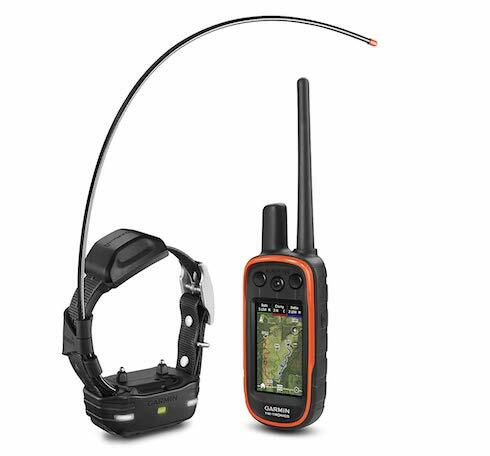 This post is meant as a resource for those interested in training with or learning more about high-quality GPS tracking collars and e-collars. These tools are not for everyone, and that is OK! 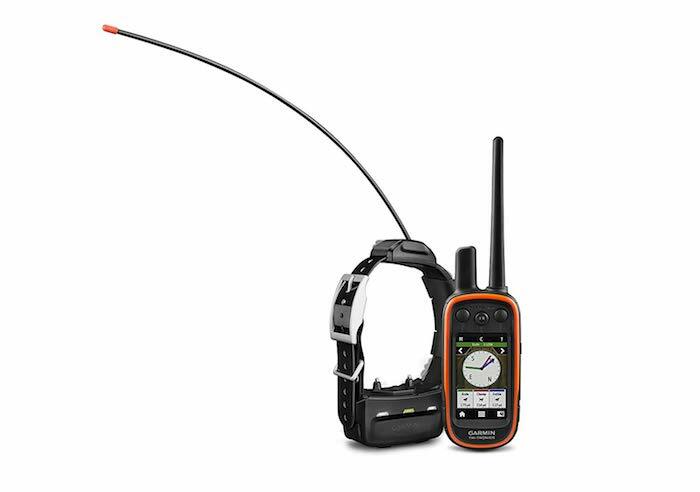 I’m going to provide you with a LOT of info about the Garmin Alpha 100 and how we use it both to track our dog and to train him to come when called. I’ll be updating the article the more I use the product. The collar is available on Amazon here. 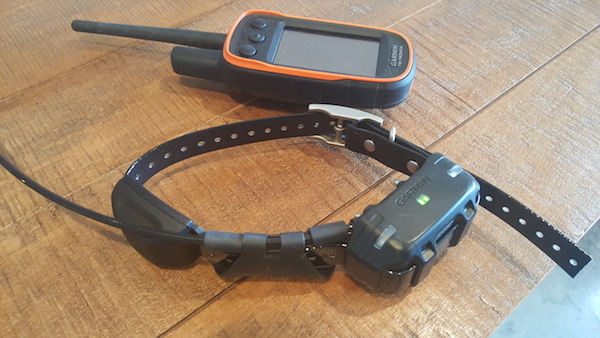 Like I said, the Alpha 100 is a two-in-one system: both a GPS tracking collar and a remote training e-collar. 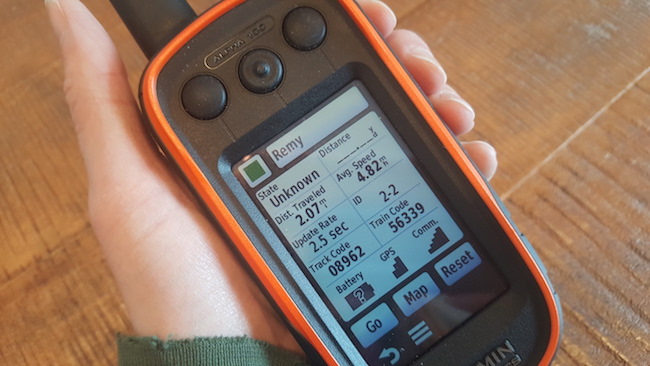 My husband Josh and I are almost always out of cell phone range on our trail runs so we wanted a dog GPS collar that runs off satellite just in case we get separated from Remy. If you lose your dog, the Alpha 100 will show you exactly where your dog is on the map in real time and lead you right to him! You just hit “Go” on the remote. It tracks up to a 9-mile radius. We also wanted an e-collar to train a more reliable off-leash recall so we can allow Remy more freedom and exercise. So far, I’ve never even had to correct my dog on the collar. He comes to me every time for a treat at the sound of the tone! 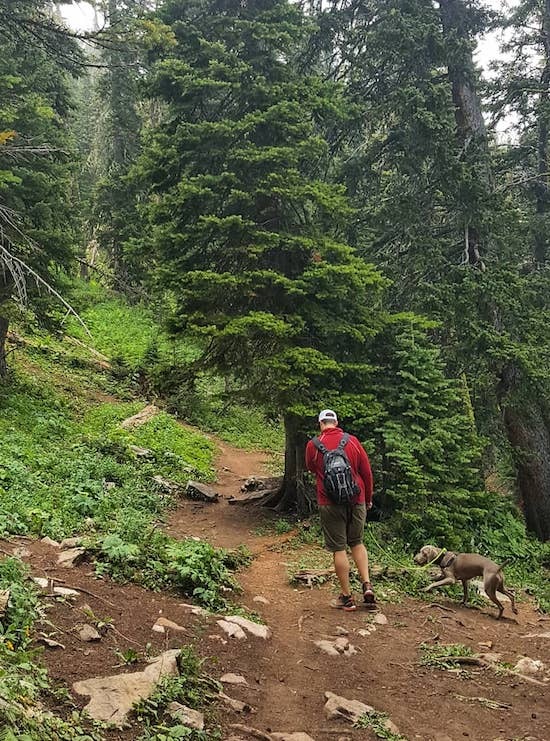 One of my favorite things about owning a dog is getting out and exploring nature in remote areas. 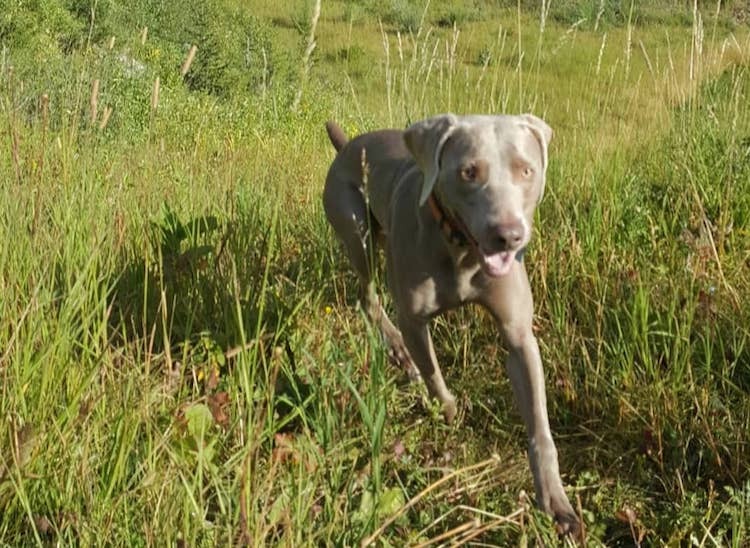 Allowing my dog time off leash to just run and just be a weimaraner is very important to me. I know many dog owners do not understand the need for a GPS or e-collar, and that is OK. In my case, the Alpha 100 is well worth it to keep my dog safe and to give him hours and hours of freedom on trails. He is a very lucky dog. First impressions are good – happy with our purchase! 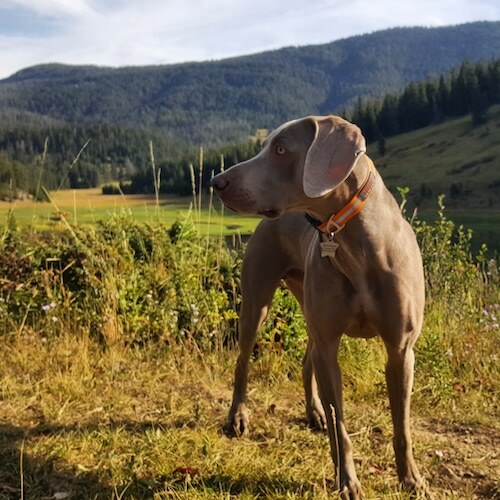 Heavy duty and will easily hold up to a rough and tough weimaraner. It’s made for hunting dogs, after all. Tons of options, more complicated than I need. Has tone, vibrate and correction options (with 18 levels). Price is about $800 for the remote + collar. We felt the price was worth it for the top quality satellite/gps collar and for how frequently we will use it. The collar seems heavy on the neck but our dog could care less. Get the collar on Amazon here. Just hit “Go” on the remote and follow the line right to your dog. No set-up fees, no monthly fees, no hidden fees! Read additional reviews on Amazon. First I’ll explain some details on how the GPS tracking works. Then I’ll explain how we’re using the e-collar for training our dog to come when called. Thankfully, we’ve never been separated from Remy on the trails. He tends to run ahead maybe 50 yards but he always comes back to us and keeps pretty close watch on us. It’s still nice to have the GPS tracking option just in case we ever lose Remy. He is a hunting breed with a strong prey drive and loves to RUN! The GPS tracking is very valuable and could save your dog’s life. We all know how quickly dogs move and how easily they can get distracted by wildlife or to follow their nose! 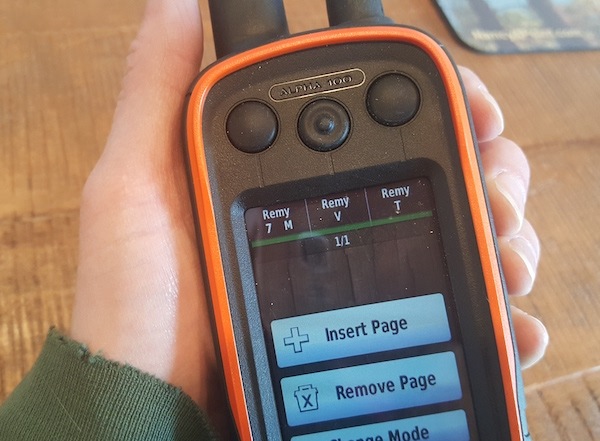 The remote handheld device allows you to track your dog in real time on the map displayed on the screen. It is able to track up to a 9-mile radius and runs off satellite. Even if you generally know where your dog is and he is not lost, you can always view his location on the map just to be sure. Next, simply follow the magenta line to your dog! A nice thing about the Alpha 100 is you can track up to 20 dogs! It’s designed for the ability to track a pack of hounds! I have not used this feature yet but if your dog crosses this invisible boundary, your device will notify you. Now I’ll give you quite a bit of info on how we’ve used the Garmin for training purposes. Just a quick note: I haven’t needed to “correct” my dog at all on this collar. Though I’m not against using e-collars for correction (and I’m sure I’ll use it eventually), it’s nice that it’s been an all-positive tool so far. More info below. Once both the collar and handheld remote were charged (took about five hours), we took some time to get used to the device on our own without involving our dog. Read the manual! Next, I wanted Remy to associate positive or neutral feelings with the collar, so I praised him and gave him treats just for wearing the collar while it was turned off. We also went out for a leashed walk while he wore it (still turned off). Remy could’ve cared less wearing the collar because he is used to wearing different gear. Some dogs may need some time to adjust to the slightly heavier weight and to the antennae that sticks out the side. I recommend you have your dog wear the collar while it is turned off for a couple of walks and around the house (supervised) so he does not associate tones, vibrations and corrections with the collar. The remote has three buttons for communicating with your dog that you program as you wish ranging from Tone to Vibrate to 18 levels of Correction. So much depends on your dog’s personality and sensitivity. Your dog’s coat type is also a factor. If he has a longer coat, he may not be as sensitive to the static correction. Choose the lowest setting possible, yet you also want it strong enough so you don’t have to give multiple corrections. Start on the low end, and increase if needed. The first button on the right feels the most natural and easiest to press for me, so I chose to mark that button as tone only. I trained my dog to come to me for a treat at the sound of the tone (more on that below) and I planned to use that button the most frequently. 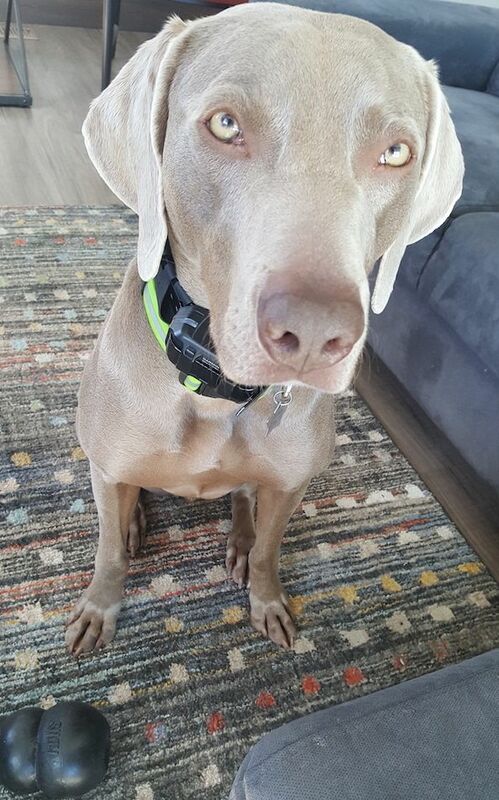 I recommend you get yourself familiar with the collar and remote without your dog around so you don’t startle him with all the random beeps and vibrations, and of course you do not want the collar on your dog at this time! The manual is pretty easy to follow – read the instructions! I recommend you try the vibration and corrections on the inside of your own wrist so you know how it might feel for your dog. For example, I set ours to correction level 4 first, which was WAY too mild. Then I tried it on level 8, which I thought was a bit too high. So I dropped it to level 7. I may adjust higher or lower depending on how Remy responds but I know he’s pretty sensitive. So far we’ve only been training with the tone (more on that below). It’s best if your dog already knows the basic commands come, sit, down and stay before you begin training with an e-collar, in my opinion. If your dog does not know these commands yet, work on them daily with a leash and treats to brush up and also to build your relationship. This is especially true if you have a newly adopted dog or a puppy. Building a strong bond is what’s most important in the beginning and throughout your dog’s life. What age should my dog be before using an e-collar? Each dog is different, but I personally would not use an e-collar on a dog under 8 months old or so. Regardless of age, I also would not use an e-collar on a dog until the dog had lived with me for about 3 months. But that’s just me. If you want to use only the tone mode, that would be different because it can be used as a positive cue. For example, I’m pairing the verbal command, “Come!” with the tone right now for Remy so he’s learning the tone simply means, “Come to me and get a treat!” That’s positive, and I think that would be a great way to begin working with a puppy or newly adopted dog. 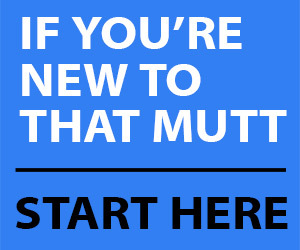 You do not necessarily need to follow the same training methods I’m using with my dog. Every dog is different and everyone has their own goals, so just be smart and plan ahead how you will be clear, fair and consistent with your unique dog. get him to stop eating poop in the yard! Begin training your dog with a long 30-ft leash while holding highly valued treats like bits of hot dogs or treats made with real meat. We like to use the brand Campfire Treats. Give the command “come!” as you trigger the tone on the collar and then praise your dog and give the treat. Since he’s on a leash, you can “reel him in” while giving verbal praise and encouragement. It’s possible your dog may be startled by the tone the first few times, so just encourage him and give praise. At the time of this writing (April 2, 2019), my dog and I are still at the tone-only training stage and it’s going really well! He is trained to come to me for a treat every time he hears the tone. He thinks this is awesome! For example, I’ve completely removed his leash on the trail and called him to me as he was sprinting away. He immediately stopped at the sound of the tone and came running back for a treat every time. Good boy! I’m so impressed because my dog would rarely come to me off leash before we had this collar. I’m continuing to use treats 90% of the time for now because I’m still setting up a solid foundation. Ideally, my dog should obey without treats and eventually I’ll use treats about 60% of the time to keep him guessing. I do not plan to remove treats entirely. I think that is a fair compromise. I recommend you only use the tone about four or five times during each training session. You want to keep the training fun and exciting for your dog. You don’t want him to get bored or to start ignoring the tone. For the vibration and static correction modes to work properly, you want the collar to fit snug and high on your dog’s neck. Not too tight, of course, but it shouldn’t be sliding around. The two “prongs” should be against your dog’s skin to be effective. Once your dog understands the tone on the collar means, “Come!” and he’s responding even with mild distractions, you can begin to use the vibration mode. Keep your dog on a long leash when introducing him to the vibration mode just in case he gets startled and bolts. To begin your training at this level, seek out a mild distraction and give your dog the “come” command with the tone as you normally would. Praise if he obeys! Good boy! If your dog does not obey, then give the vibration on the collar and repeat, “Come!” This will likely surprise him and you can “reel him in” with your long leash if needed. Give him tons of praise when he comes to you, and food. Good boy! Then, switch to something else for a few minutes like playing tug or working on simple obedience like sit and down for treats. You want to keep this fun! Keep your training sessions short, just a few minutes. You do not want to stress your dog out and you also don’t want to desensitize him to the collar’s tone, vibration or correction. Increase distractions slowly so your dog can be successful. You should not have to give multiple vibration warnings or static corrections. “Mild distractions” for your dog could simply mean you practice in the back yard or on your own driveway. You want to make it easy for your dog to obey, but eventually you do want to start increasing the distractions. If your dog is not responding to the vibration mode, I recommend you decrease the distractions you are working around. OR, you might need to skip the vibration mode with your particular dog and work with a low static correction mode. The vibration mode is so mild (it’s just a sound, you don’t really feel anything), so I might not use it for Remy long term. I will likely change our original three buttons to tone, static correction at a low level and a static correction at a medium level. You want to use the lowest setting possible that allows you to only give your dog a single correction. If you’re correcting multiple times, it’s too low or the collar is too loose. Do several short training sessions over a few days or weeks using the tone and vibration modes before you introduce the static correction on the collar. You may not even need to use the correction mode or you may not want to. Either way is fine! Yes, you can use an e-collar as a “positive only” training tool by using the tone only setting if you choose. It’s also up to you if you want to continue using the vibration mode as an “in between” warning for your dog or if you want to weed out the vibration at this point and switch to static correction. I find that the vibration setting is so mild it probably makes more sense to switch to static correction for a lot of dogs. See my tips in the beginning of this article for how to decide which level to use for your dog. Test it out on the inside of your own wrist first and start out fairly low. 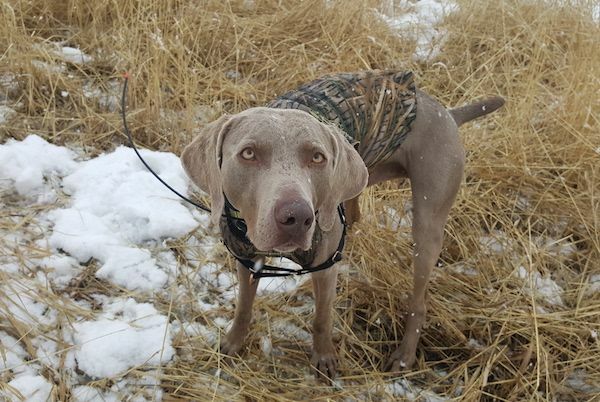 I chose to start with level 7 (out of 18) for my 60-pound, short haired weimaraner. He is both a sensitive and easily distracted dog. Introduce the correction mode to your dog the same way you did when you first introduced the vibration mode. Only now, your dog should be able to come when called more reliably around slightly higher distractions. Start out with your verbal command “come!” and the tone. If your dog does not respond, give a single static correction and repeat “come.” Give LOTS of praise when he obeys and “reel him in” on his long leash if he doesn’t obey. No matter what, always praise your dog when he comes to you, even if you have to reel him in! Never punish your dog for coming to you! Even if you are seriously annoyed. Haha. I will continue to update this post as we continue to use this collar. 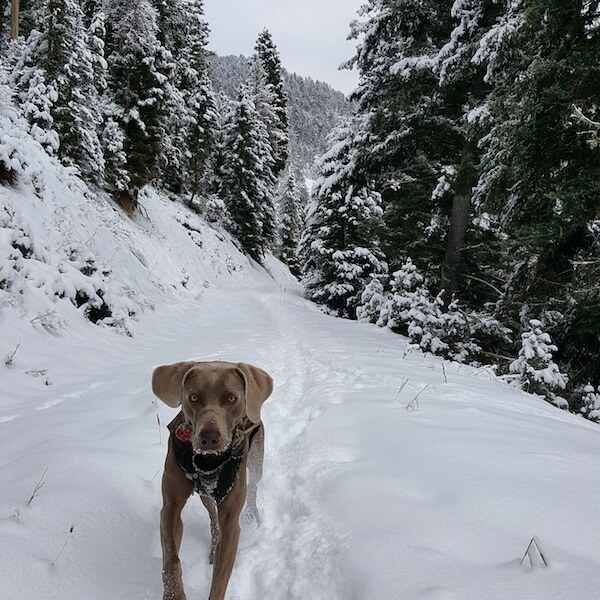 We are still in the beginning stages of training with our collar, so I will have much more to share as we get closer to summer and begin using this collar on our off-leash hikes and runs more frequently. 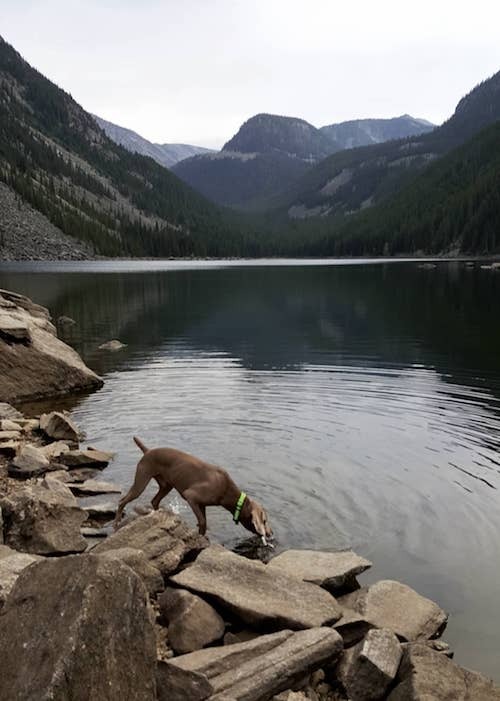 I can’t wait to get out and explore Montana with my dog! So far, I am very happy with our Alpha 100. My dog responds very fast and consistently to the collar, and I’m glad I made a point to introduce it slowly and in a positive way. It’s very important that you are fair to your dog and set him up for success. Don’t just slap the collar on him and starting giving corrections! 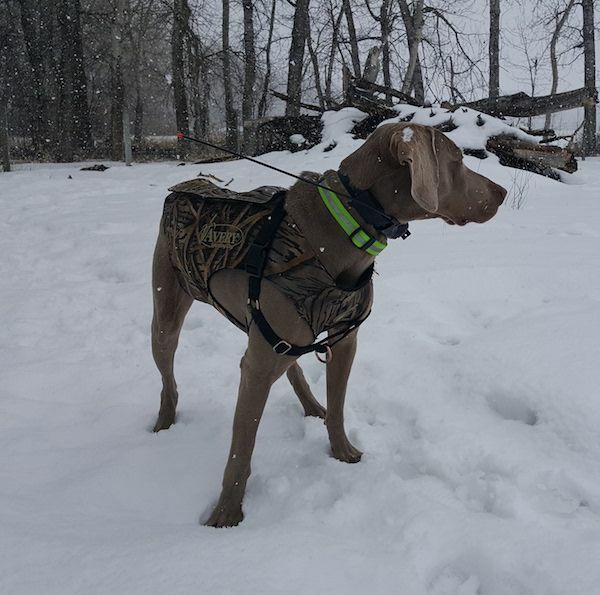 Take the time to really get familiar with the product first and come up with a solid plan for your unique dog. It’s also just fine if you chose to use the collar only for the GPS tracking purposes. For some dogs, there’s no need to use it for training and I’d say it’s still worth the value. If you have any questions about this collar, please leave them below and I’ll do my best to answer them. In the meantime, you can also read the reviews posted on Amazon HERE.